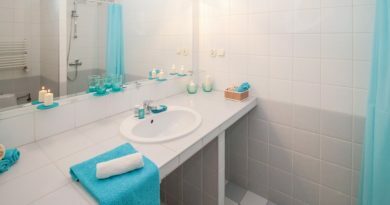 Though it might not be as important as the bedroom, a well looked after bathroom is essential to any girly girl to help make her pad feel like home. For all those women who love everything pretty in pink, we’ve rounded up 5 essentials that the girliest of girls shouldn’t be without in their bathroom. From your glamorous Hollywood style mirrors to chandeliers and sparkles, this is the top checklist for the ultimate girly bathroom. 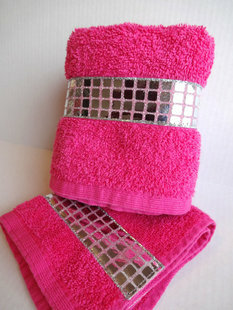 When you step out of the shower you’ll definitely want to be wrapping yourself up in one of these hot pink, blinged up towels. Available as a washcloth, hand towel, or full-size bath towel your bathroom will be one step closer to the ultimate girly retreat. A bathroom fit for a princess wouldn’t be complete without a glitzy, glamorous chandelier. Available to buy online from many retailers we’ve picked this beautiful 5 light chandelier from the sale in BHS. Bring Hollywood Art Deco style to your bathroom with one of these stunning Hollywood Mirrors. They’re super stylish and are perfect for applying your make-up. With fitted lights, your bathroom will look like a glamorous Hollywood-style dressing room in no time. Everyone needs a little sparkle, and we all know a girl can never have too many shoes. Top it off with a cute girly quote and you have the perfect girly shower curtain. This gorgeous and glittery “Will Work For Shoes” shower curtain could be the missing piece to your ultimate girly girl bathroom. To complete your bathroom we’ve picked out this super soft cotton diamante bath mat. For that last extra special sparkle, and twinkly toes, this bath mat will make the perfect finishing touches to your super glamorous girly girl bathroom.